Our "Top Pick" Florida Vacation Beaches Guide Book - Great resource! Includes reviews on Florida vacation beaches + Attraction ratings and rankings by age group. Also money saving Tips. Even some links to printable discount coupons! The Melbourne Florida area has a lot of restaurant options and is located only about 8 miles southwest of Satellite Beach. We are only repoorting here on the particularly good dining options we have discovered that are either oceanfront or riverfront Melbourne Florida seafood restaurant favorites. Share your own Melbourne Area Favorite Waterfront Restaurant "Rave" or "Review" on This Favorite Melbourne Restaurant Reviews Page. You Might be a Winner in the Contest! + See the Restaurant "Raves and "Reviews" Other Site Viewers have shared. Map - To a Local Map of Bonefish Willy's Restaurant Riverfront location - You can click on the Restaurant map to "grab" it and recenter it on the page if you wish. Bonefish Willy's Riverfront Grille is off of the "beaten path" in essentially a residential area, and does not "look" like a "Top Pick" waterfront seafood restaurant from the outside -- and even the small inside dining area you walk thru to get to the back outside riverfront seating area made us wonder what we were getting into. 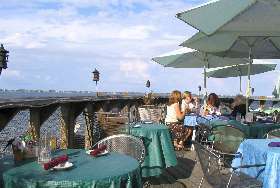 The attractive riverfront dining deck, however, offers great views of the boat traffic on the river and of the many tall buildings in the distance across the intercoastal waterway, and even some of the taller buildings along the A1A "oceanfront" highway. The view after dark of the boat lights and lighted buildings across the river is particularly peaceful and relaxing while enjoying good food. Bonefish Willy's has Mon - Fri happy hour, Fri and Sat night live entertainment, is open on Sundays, and has some special 12 and under "Willy's Wee Ones" menu items. We found both the food and service at Bonefish Willy's restaurant to be good, and the prices reasonable. Several tables of "locals" were dining there when we were there, so some of them must have "discovered" it. My Wife and I would rate Bonefish Willy's Riverfront Grill as a "Top Pick" Melbourne Florida restaurant. Take a fun Florida -- or wherever -- US mini-Vacation. Check out the highly discounted Getaway Vacation Lodging Packages on our new Timeshare Vacation Promotions page - direct Links to popular Vacation Getaway Discount Deals from $79 - most include free Attraction Tickets! There used to be another great riverfront Melbourne Florida seafood restaurant with spectacular river views at 1477 Pinapple Avenue near the west end of the Eau Gallie 518 Causeway - originally Concy Joe's Seafood Restaurant for many years and many great dining experiences for our family. 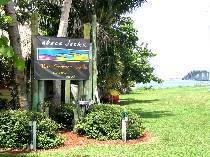 It then changed to Abaco Jacks Restaurant a couple of years ago, but closed in late June, 2006. We hope it gets purchased by some owners who can make it as a restaurant at the great location on the Intercoastal Waterway Vs the riverfront location getting purchased as a spot for some high rise condos. - (321) 729-6558 - next to the waterfront park on the south side at the west end of the Eau Gallie Causeway (518) bridge. 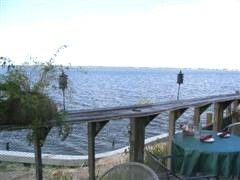 It is located on the water such that it should have great views across the river which was of definate interest to us. Some "locals," however, had also warned us that the prices tended to be a bit high and it was not really "casual" riverfront dining. We decided to check it out for ourselves anyway, but when we pulled up and saw it was Valet Parking, plus the way people were dressed going in, we chickened out and drove north up Pineapple Avenue -- and that was the evening we first discovered Bonefish Willy's above -- a great casual dining Melbourne Florida Restaurant "Top Pick" discovery! Share your own Melbourne, FL Area Favorite Waterfront Restaurant "Rave" or "Review" on This Favorite Melbourne Restaurant Reviews Page. You Might be a Winner in the Contest! The Chart House is a national restaurant chain. You can check out their web site description of their Melbourne, FL Restaurant and others at this link + see a photo of a view of the river from their outside dining area. We are going to check out the Chart House Restaurant on our next trip fo the Melbourne, Florida are, and will then have a "review" plus a picture or two of our own of the Chart House, Melbourne FL dining view posted here. (For now, we suggest you dress a bit up from casual "shopping" wear.) Please let us know about your Chart House dining experience on our Comments Form + send a picture or two. - Thanks! Ten to 15 minutes to north up A1A "oceanfront" Hwy - Waterfront Cocoa Beach FL Restaurant Top Picks - "Reviews, Pictures & Tips. MANY great Oceanfront and Waterfront Restaurant choices in the Cocoa Beach and Port areas. 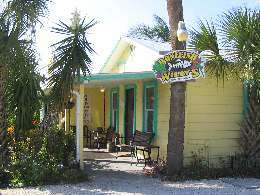 Also see our nearby Cocoa Village Restaurant Top Pick page, plus Info on an "On the River" Seafood Restaurant favorite - "Chowders" - about 10 minutes North of Melbourne in Rockledge right on Hwy 1. You can drive on north on Hwy 1 to historic Cocoa Village for some enjoyable shopping + check out some interesting Historical Cocoa Village buildings (and a directory of shops).
. . . a great easy-to-read local map of the Cocoa - Satellite Beach area and the Inter-Costal Waterway Causeway Bridges + Attraction locations! An unusually helpful map! To a page of "Must Sees," Tips, and Pictures of a Florida St. Augustine Attractions Day Trip. Please send us any good "on the water" Melbourne Florida Restaurant Favorites, points of interest, or Attractions which you have discovered that are not mentioned here. Any good or bad experiences you have had with any of our area waterfront Melbourne Florida Seafood Restaurant listings would also be appreciated. Send them to us on this Gene Seecann Sites Comment Form Page. Or, just send us your general suggestions or comments for this or any of our Go US Beaches Web Site pages, or on any of our Scenic Florida Pictures. Thanks! Florida Vacation Beaches Rentals - Reviews - Cocoa Beach & Satellite Beach - Resort and Timeshare Rental Reviews and Tips.